Two wannabe cops and then two hitmen walk into a motel room. Oh, and there are actually two conjoined motel rooms, eight doors, an embezzler, and a set of bagpipes. Each twist, literal and figurative, sends audiences further and further down a rabbit hole of zany, laugh-out-loud comedy in the Great American Melodrama’s adaptation of Paul Slade Smith’s (The Outsider) contemporary play, Unnecessary Farce. Todd (Ben Abbott, center) just wants to play his bagpipes before he murders his victims, much to the confusion and fear of wannabe cop Billie Dwyer (Eleise Moore, right) and Agent Frank (Mike Fiore). In a cheap motel room, embezzling Mayor Meekly (Billy Breed, SLO Repertory Theatre’s A Funny Thing Happened on the Way to the Forum) meets with his female accountant, Karen Brown (Rebecca Tucker, Steel Magnolias). In the next room, two cops, Billie Dwyer (Eleise Moore, Steel Magnolias) and Eric Sheridan (Nicholas Wilder, Baskerville), wait to catch the meeting on video. But there’s some confusion as to who’s in which room, who’s taken the money, and who’s hired the Scottish hitman with anger issues, Todd (Ben Abbott, The Holiday Extravaganza). Meanwhile, Mrs. Meekly (Annali Fuchs-Wackowski, Scary Poppins) searches in vain for her husband and Agent Frank (Mike Fiore, A Funny Thing Happened on the Way to the Forum), a security guard to the mayor who tries to be brave. 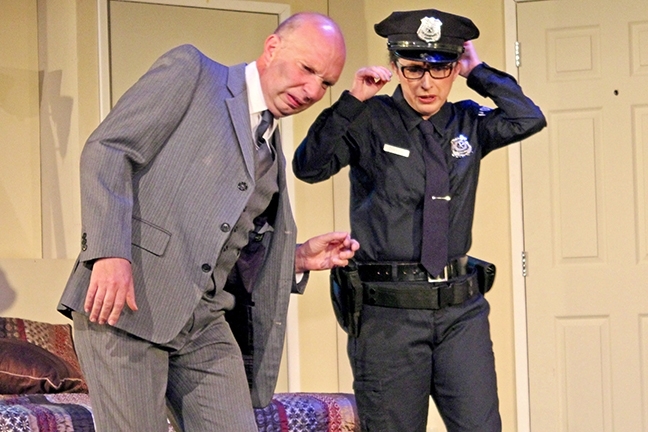 'Unnecessary Farce' is onstage at the Great American Melodrama through April 28. Tickets range from $23 to $30. Visit americanmelodrama.com for more information. It’s a lot of people and storylines to follow, but Unnecessary Farce keeps things moving and rolls with the punches, using physical comedy from a cast of seven people constantly going in and out of four sets of doors, all the while trying to rescue and be rescued as they attempt to solve a financial crime and prevent a murder. Moore and Wilder are loveably goofy and inept as the worst police officers on the force. Tucker as Miss Brown, the accountant, is a capable and cunning damsel in distress. 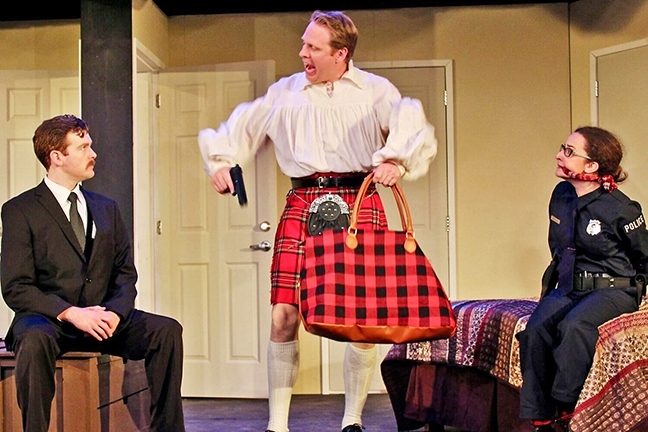 Abbott as the Scottish Clan’s bagpipe-playing hitman, Todd, is charming and hilarious in his delivery of a rage-filled Scottish rant that’s just too thick to decipher. While Fiore as Agent Frank is akin to the cowardly lion, who may just be brave after all. And Breed and Fuchs-Wackowski as Mayor and Mrs. Meekly, respectively, are not who they seem. When a videotaped attempt to catch an embezzler confess in a hotel room goes awry, Mayor Meekly (Billy Breed) and officer Billie Dwyer (Eleise Moore) get more of a show than either bargained for. After the show, of course, there’s the vaudeville review, The Jungle Adventure, which takes audiences on a musical journey with a brave explorer, several sidekicks, a perky cruise ship attendant, and the Tarzan family. For a charming whodunnit-style comedy, with a less-than-predictable plot twist, Unnecessary Farce goes above and beyond. New Times Arts Writer Ryah Cooley from the Sun’s sister paper is laughing in the back row. Contact her at rcooley@newtimesslo.com.